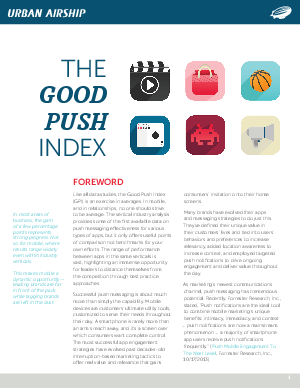 In our third and most expansive Good Push Index data study (examining more than 2,400 apps and 500 million push notifications), we reveal how push messaging influences mobile app users’ behavior, measuring both engagement and retention over a six-month period. Discover some of the first insights on push messaging’s effectiveness, including a quantitative view of opt-in rates, across key industry verticals—Retail, Media, Sports, Games, Gambling and Entertainment. This in-depth report offers insights such as how push messaging influences mobile app users’ engagement and retention rates. You’ll also learn tips and tactics used by top performers to pull ahead of the pack.